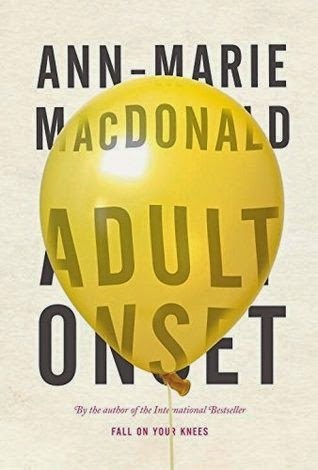 Adult Onset is a slow but intense read. The internal narrative by Marie Rose versus what’s actually happening around her often becomes twisted together so you’re unclear what is current and what is in her past. Although integrate it was as if you were reading through a haze which mirrors Marie Rose’s unravelling of her own thoughts. There is a lot to discover in this novel and a lot being explored- from simple family relationships to a more complicated history between the members. We are also exposed to a rare medical condition and its’ implications when Marie Rose tries to discover the source. I found most of the novel a bit sad- I think it’s a testament to the author though that you still wanted to keep on reading and that there were some relationships that were so deep with love that you had to continue to see how they survived. Although there were very few funny moments I actually found the most light-heartedness in Marie-Rose’s thoughts when dealing with her small children, largely on her own. Unfortunately, she is battling with her own dark thoughts at times and feels as if her rage at her children is ominous, to me though her feelings were quite normal for most parents and I challenge a parent to say they have never wanted to grab a child by the arm or shout at the top of their lungs. I wish the novel had explored Marie-Rose’s relationship with her sister a bit more. I feel there was a lot there that would have helped her uncover her truths and I wished a bit that there had been more current scenes between her and Hilary- not just phone conversations. I felt their love but wished we’d “seen” it with them together. There was also some repetitiveness that could have perhaps been removed to make the story flow more easily. I enjoyed Adult Onset, it was fascinating, intriguing and opened my eyes but wished it had been a bit faster paced.